Another week, another pizza. 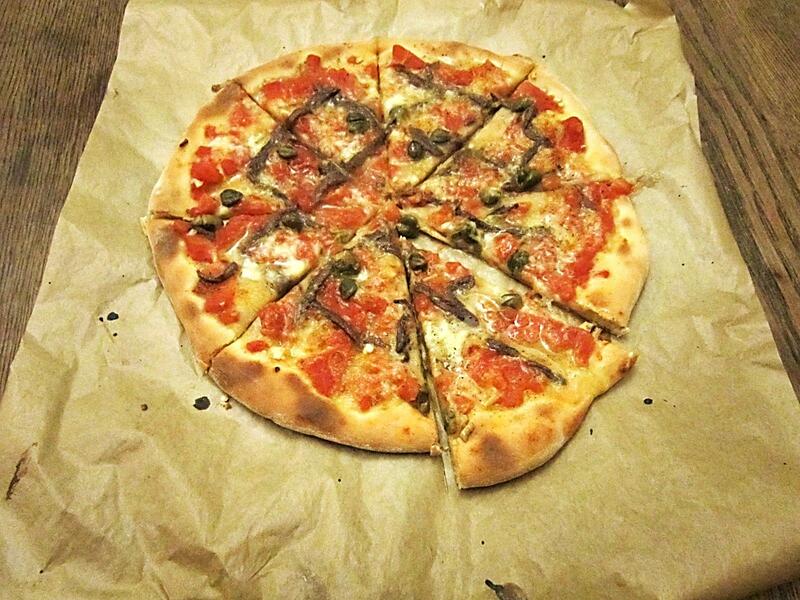 This week the nemesis of many pizza lovers in this country: the anchovy. Yes, they have a pungent taste. Yes, they are intensely fishy and salty. Yes, they can be overpowering if not used correctly, but these tiny herrings are swimming with umami and glutamates that, like truffles, enhance the savoury notes of the dish. It’s an indescribable fifth taste that is not sweet, sour, salty or bitter, but lingers at the back of your palate. Cuisines all over the world use the humble anchovy, not to provide a fishy flavour, but to give that extra something to a meal. You can find it in pretty much every South-East Asian and Chinese meals, and what about our own Worcestershire sauce? Maybe you splash it on grilled cheese on toast or add it to a stew, but did you know it’s basically an anchovy essence. The briny piquancy of capers is the perfect partner for the anchovy, and delicious on pizza. For this I tried a raw tomato base, chopping up the peeled plum tomatoes, but reserving the juice. 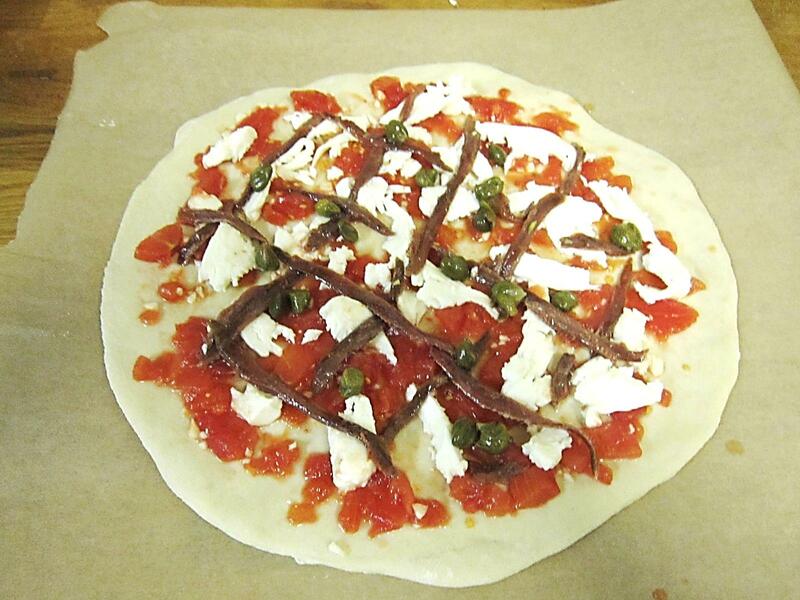 The anchovy melts into the topping like the mozzarella. We’re definitely anchovy lovers in this house (especially boquerones), but if you’re not convinced, try chopping one up and scattering it over a quarter. Go on, give it a try! Depends how hungry you are! METHOD: Preheat your oven to its highest setting. Drain the tin of peeled plum tomatoes, reserving the juice for a soup, stew, etc. Chop up the tomatoes and put the flesh in a bowl with the seasoning and a drizzle of olive oil. The tomato based shouldn’t be watery. I think tinned varieties have improved in quality as I always used to add a pinch of sugar to balance out the metallic taste, but no longer find this necessary so just season with salt and pepper. If you find your tinned tomatoes lacking in flavour, you can add a squeeze of tomato puree. Dust the worktop with a little flour and flatten the ball of dough, knocking the air out of it with your fingertips. Stretch the pizza dough until it is as thin as possible mounding the dough up slightly around the edges. You can use a rolling pin to start it off, but stretching by hand really helps the texture. Smear on the tomato sauce right up to the edges and scatter over the garlic and the thinly sliced mozzarella. Working quickly so the sauce does not soak into the dough, arrange the anchovy fillets on the pizza base and sprinkle on the capers, spreading them out evenly so every mouthful has a delicious burst of umami flavour. When topped to perfection, transfer to a pre-heated baking sheet (I assemble the pizza on a sheet of greaseproof paper as don’t have a paddle and more importantly, am clumsy) and cook for about 6-8 minutes until crisp and golden. You’ve got to watch them, as the timing depends on your oven and the thinness or your base. Remove, drizzle with a splash of chilli oil – cut into wedges and enjoy with a glass of vino. I always like fish pizza. I don`t know why, as I usually prefer my fish fresh instead of canned, but I love sardines, gouda, and ranch with apple slices for a fresh pizza. I add Thai Queen basil when it`s fresh as well, and it is about as healthy as salad, and ten times yummier! Yep, I agree pizza can definitely be as healthy as a salad – especially if you throw a handful of rocket on top! Oh, that sounds like a nice addition!